Welcome to 'Paradise'! What an amazing collection this is. Fabulously observed details with an unusual array of insects: bees, butterflies and beetles. Available in satin silver plate with some mixed gold plated elements OR satin gold plate with some mixed silver plated elements. 'Paradise' insect motif bangle from 'The Bohm'. An unusual organic design, with finely detailed insects: beetle, bee and butterfly among lots of pretty paste, quartz and glass beads. The motifs and beads measure from 6mm up to 3.5cm/35mm. The bangle is 5.5mm wide with a flat curb-chain applied to the outer-side. The inner diameter is 7cm/70mm. Inner circumference measures approx. 8.25 inches/21cm. Fabulously detailed 'Paradise' bracelet by 'The Bohm', with finely detailed insects: beetle, bee and butterfly among lots of pretty paste, quartz and glass beads. The motifs and beads measure from 6mm up to 3cm/30mm. Length 7.5 inches/19cm to an adjustable 9 inches/23cm. 'Paradise' insect motif necklace from 'The Bohm'. An unusual organic design, with finely detailed insects: beetle, bee and butterfly among lots of pretty paste, quartz and glass beads. The motifs and beads measure from 6mm up to 3.5cm/35mm. The necklace measures 41cm/16 inches to an adjustable 48cm/19 inches. 'Paradise' butterfly ring. Adjustable size. Butterfly measures 3.5cm/35mm wingspan. 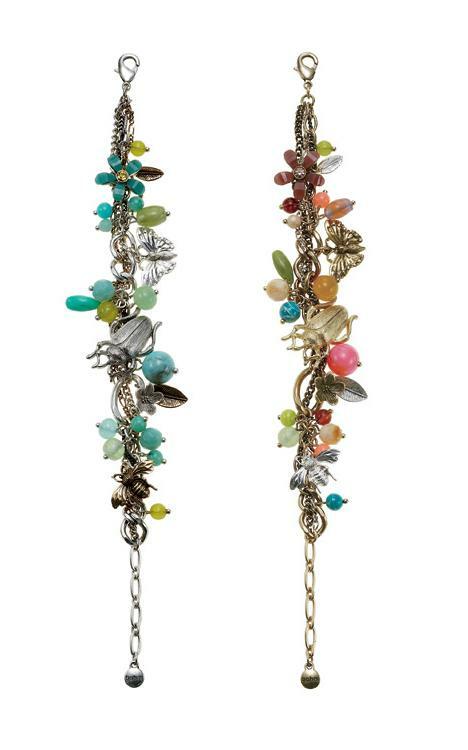 'Paradise' bee chain cascade earrings from 'The Bohm'. Bee wingspan measures 2cm/20mm. Mixed plated chains (on both versions). Total length 6.5cm/65mm. Post with bullet back for pierced ears. 2 Pairs of 'Paradise' earrings from 'The Bohm'. Butterfly wingspan measures 2cm/20mm. Flower measures 1.5cm/15mm. Post with bullet back for pierced ears. 'Paradise' flower and small bead cascade earrings from 'The Bohm'. Flowers measure 1cm/10mm. A pretty mix of glass, quartz and paste beads (5mm - 6mm). Total length 6cm/60mm. Post with bullet back for pierced ears. The very popular 'Paradise' beetle hair clip is now back in stock! The beetle is 4cm/40mm in length. The sprung clip is 4 cm/40mm long and will hold firmly a small section of hair. 'Paradise' bumble bee ring with Swarovski crystal details. Adjustable size. Bee has 5.5cm/55mm wingspan. 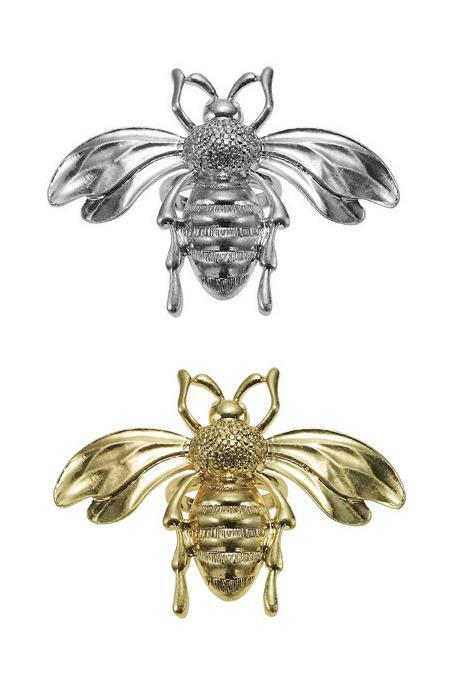 'Paradise' bee stud earrings from 'The Bohm'. Milky white opal Swarovski crystals form the eyes. Bee wingspan measures 3cm/30mm. Post with bullet back for pierced ears.